NBN Co and Telstra: History repeating? blog We couldn’t help but laugh at this photo sent in by a reader this week. 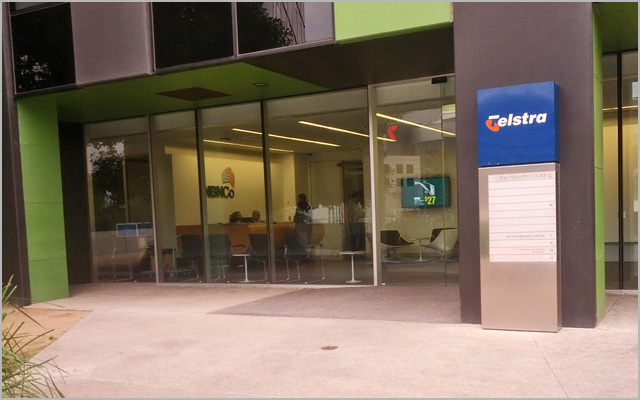 Apparently NBN Co has decided to locate one of its facilities (we’re not actually sure which one) inside a building owned by Telstra. The whole thing has a whole ‘history repeating’ feel about it. Is this NBN Co brought to you by Telstra? Or Telstra brought to you by NBN Co? It’s like one of those Russian Matryoshka dolls; the further you go inside the wormhole, the more you find smaller iterations of the same thing. Crazy. This is the NBN Co NOC at the Docklands in Melbourne. I don’t know if Telstra owns the building, but Telstra at least were a tenant of the building – they may still use part of the building, but I don’t believe so. Correcto. NBNCo lease from Telstra. In fact 2 floors are still Telstra training rooms. I wouldn’t mind Telstra pre privatisation. They actually fixed your phone line if there is a problem. When ADSL first came out they bent over backwards to sort out any problems. Then they were privatised, maintenance and service vanished. > I wouldn’t mind Telstra pre privatisation. They actually fixed your phone line if there is a problem. When ADSL first came out they bent over backwards to sort out any problems. Then they were privatised, maintenance and service vanished. The advantage is most people can actually afford to make phone calls now. The government sold the Telstra shares in 1997 (33%), 1999 (16%) & 2006 (34%). ADSL became available to consumers in 2000. Part of the lease deal, I would presume? Gaining access to buildings and infrastructure as part of the not-inconsiderable sum paid to Telstra. The NBN to be ‘privatised’ to Telstra as the only organisation ‘qualified to manage the situation’ after a brief introductory period. How to get a civilian population to pay for the upgrade and maintenance programme of a national network well in retrograde and then be dispossessed of the investment…again. Bit early for the tin-foil hat? And all over a picture of a building NBN Co are using that happens to still have some Telstra signage on it. Derp. There also appears to be a Channel 7 logo reflecting in the window and an advertisement for a tap from Bunnings playing on the TV screen inside. There is obviously a conspiracy here between 7 West media, Wesfarmes, Testra and NBNco… but to what end??? ?